Barbecue joint made famous by Calvin Trillin known for massive piles of wood-smoked meats, served between white bread. 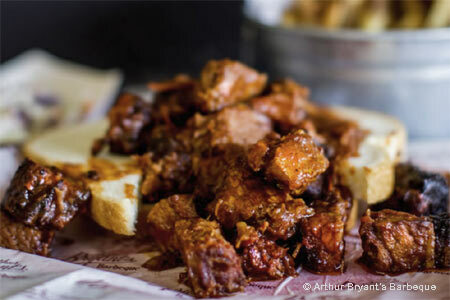 : Pitmasters pile wood-smoked meats onto slices of white bread painted with sauce at Arthur Bryant's Barbeque in Kansas City. They do up three sauces here, including the original, which has a dusky texture. They also cover all the bases when it comes to traditional sides: Creamy coleslaw made from finely shredded cabbage, meaty beans and fresh-cut, peel-on french fries. Wash it all down with a red cream soda or a Boulevard Pale Ale. Also located at the Kansas Speedway, 1702 Village West Parkway, 913-788-7500.